Jim Turpin is the owner of Speedy Oiler, located in Evansville, Indiana. The shop was recently the target of a robbery and arsonist attack. It was nearly burned to the ground, but despite the botched arsonist attack, Jim has been able to keep the Speedy Oiler open for business. Along with that, a red Chevrolet C4 Corvette that was in the shop at the time some how took just minimal damage. The Evansville Fire Department Investigator, Richard Howard, reported that someone allegedly broke into the business and started two fires. 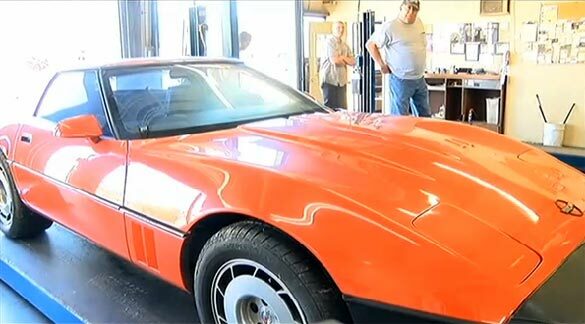 One fire began after a perpetrator lit an oil rag on fire and shoved it into the gas tank of the Corvette. The second fire was started in the back office of the Speedy Oiler. The two fires lead us to believe that someone definitely wanted the Speedy Oiler off the map. The fire damaged multiple pieces of expensive equipment in the office, as well as destroying the office itself. On a good note, the C4 was only lightly damaged around the gas filler area and the thieves didn’t bother to take the company’s safe. Not many Corvettes catch a fire near the gas tank and roll away nearly scotch free, maybe the C4 is toughest Corvette ever built by Chevrolet? Jim says he has no idea why anyone would want to do this to his shop. Hopefully the crooks will soon be caught. In the meantime, watch the video below for a look at the damage done to the Speedy Oiler, then let us know what you think. Was the fire a cover up for the robbery, or is someone motivated to hurt the business? For a video, check out CorvetteBlogger.